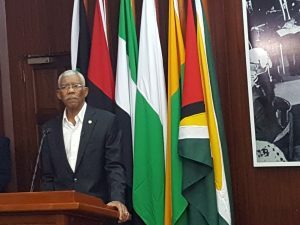 President David Granger speaking at a news conference on 31st August, 2018. President David Granger on Friday hinted that he would run again in 2020 for the nation’s top elected post if he is chosen. “I cannot answer the question at the present time. It is speculative. I’m a servant of my party I’m a servant of the partnership, I’m a servant of the coalition and my duty is to serve and I will not run away from service,” he said. Granger appeared to suggest that the final decision rests with his People’s National Congress Reform-dominated A Partnership for National Unity (APNU), a loosely-knit grouping of four other smaller political parties. “Once those processes function, but at present I cannot say what the outcome of those processes will be,” he told reporters at a news conference held at the Ministry of the Presidency. He said democratic processes had seen him having been picked as presidential candidate, Chairman of A Partnership for National Unity and leader of the People’s National Congress Reform. Well-placed insiders have suggested strongly that the governing coalition’s Presidential candidate might be another senior PNCR politician who could be picked through APNU as a consensus candidate. The election of Volda Lawrence earlier this month as the Chairperson of the People’s National Congress Reform has resulted in speculation in some quarters that Granger might run again and eventually hand over power to her if the coalition wins again. The Chairman of the People’s National Congress Reform is the second highest elected post and the office-holder is regarded as the Deputy Leader. APNU also includes the Working People’s Alliance, Justice For All Party, Guyana Action Party, and National Front Alliance.